In Part 1 of our 10 Year Project Showcase, we focused our attention on an indoor riding arena, a beautiful timber frame home, and a gorgeous equestrian facility. In Part 2 of this series, we’ll show you a luxury barn, a custom shop for a trucking company, and a fun pet resort. In 2017 we completed a beautiful 4 stall barn for Bill and Kathie in Flemington, NJ. The couple wanted a custom horse barn with caretaker’s living quarters and a space for the retired racing thoroughbreds they care for. For the couple, comfort for their horses was paramount. Their barn features custom powder coated stalls, rubber pavers in the aisle, and a spacious cathedral ceiling. Every stall has a dutch door allowing for ventilation and an emergency exit. When the couple travels, they want comfortable living quarters for their caretaker. We built an attached one-bedroom apartment with a spacious kitchen / lounge that includes a three person bar. A fire wall separates the living quarters from the barn. As designers and builders, we love helping customers create unique and creative spaces. We enjoy combining our creativity with practical building solutions to create features that meet our customers’ needs and dreams! The Garber family of GFI Transport in Mount Joy, PA, hired us to build a new shop to service their fleet of trucks and trailers, along with an attached office space. We built a 5,000 sq. ft. shop with a 22 foot cathedral ceiling to accommodate large equipment. Radiant floor heat keeps the shop warm and reduces energy costs. GFI installed a furnace that uses recycled oil from their trucks. The 2,400 sq. ft. office features an 800 sq. ft. attic for extra storage space and the option for future offices. We enjoy creating spaces that are attractive and welcoming. For this particular project we designed a traditional timber frame entrance with stone pillars. The owners also requested exposed beams and a stained wooden stair railing that make the interior reception area very warm and inviting. We worked closely with the Garbers to make their vision happen. It was truly a team effort as we problem-solved together when challenges arose. We value working closely with our clients to ensure the best outcome. In June of 2018, we completed the gorgeous Greenlin Pet Resorts project. The owners, Doug and Steph, and their daughter, Jenn, hired us to build a brand new 10,000 square-foot, two-story pet resort in Mechanicsburg, PA. The Lambs Gap Road location is one of three Greenlin resorts, which offer daycare and overnight accommodations for dogs and cats. 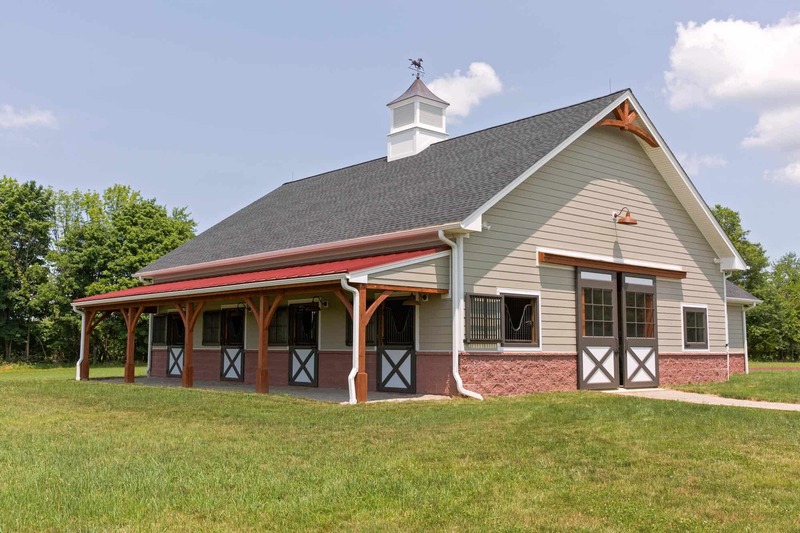 The owners wanted the appearance of a barn rather than a commercial pet kennel, so we installed Dutch doors and three cupolas to bring their vision to life. The resort features a walk-out basement that includes an indoor swimming pool, sleeping quarters, a wash room for baths, and access to a fenced grassy play area. The main floor consists mostly of a large play area. The exterior shell is sound-proofed and the materials inside deaden sound to keep the animals relaxed and comfortable. We developed an amazing relationship with the owners. Our families have participated in several social activities together, and we even had the pleasure of taking Doug and Steph out to dinner to celebrate his birthday! Thank you for joining us for our 10-Year Project Showcase! We have had the pleasure of working with incredible customers who we’ve made lasting relationships over the years, and we can’t wait to see what the future holds! Reach out to us for your next project, and maybe we’ll feature you in our next showcase!